Slow Puss was found as a tiny kitten in a cardboard box abandoned on the roadside. Our memories of Slow Puss as a young cat have faded, but we remember that he was slow even then. Slow Puss never came out here in the country, but his cat-legend lives on here in the plants, grasses and trees. He is the cat we all like to remember. He grew up as the children grew up. He was the longest cat in their lives. We remember his hopeless sense of balance and his refusal to eat any tinned cat food. We remember all the family jokes about the cat's slowness, and his dreadful gum-rubbing habit. During his last years he got slower and slower, gradually loosing his fur and ending up looking like a bladder on legs. 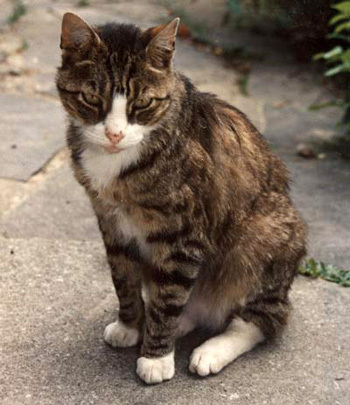 He was finally assisted to die when 20 years old by a most sympathetic vet. It's hard not to smile as we remember him - the slowest cat that ever lived.